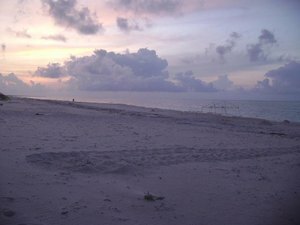 And then sometimes, the mama turtles just choose interesting spots for their nests, even with a big wide open beach. At top, she went all the way across the beach to the foot of the dune, climbed the dune between two sand fences, layed her nest, and ended up bushwhacking her way back to the beach via a line of scrub brush on the other side of this high dune. She wanted that nest up high, I guess. 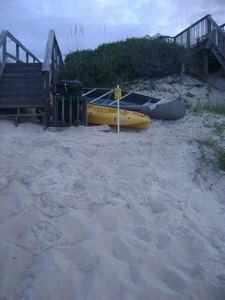 In the middle, she left a very long track that led up to the dune, showing where she tried to top the dune and could not, but continued to travel sideways along the dune until she hit this kayak and canoe that were correctly pulled all the way up and under the boardwalk. She actually had to scrape out sand from under the kayak to finish throwing sand at the end of her nesting process. 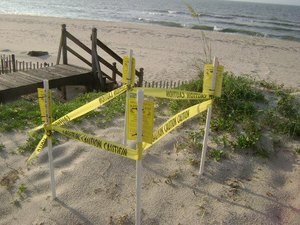 At bottom is how we love to see it - a nice open, clear beach, a nest layed well up on the beach, but with no evidence that the mama turtle had any problems beyond the struggle inherent in walking on sand with flippers when you weigh 100 pounds or more.